We've raised over £6,000 for local Leicester people in need! We’re celebrating raising over £6,000 for local people in need! Tuesday 5th September 2017 is the International Day of Charity and today we pledge our ongoing support to local Leicester charity, Charity Link. Our donation will help ensure that the most vulnerable people in our community receive the essential items they need to ensure a decent standard of living. In January 2016 we chose to partner with Charity Link as it helps local people have a safe, secure and happy home. For every successful property sale we make a donation to Charity Link and we encourage our clients to do the same. We have also had tremendous fun by raising funds via an auction, office cake sales and Charity Link’s annual “Wear a Funky Scarf Day”. Charity Link finds funding to provide clothing, beds, cookers, fridges, mobility equipment and other essential items for local people in need. Due to its unique way of working (for every £10 donated Charity Link can raise £50 from charitable trusts, all of which goes to provide essential items). Readings support of £6,000 has actually helped to provide over £30,000 worth of items to vulnerable local people since the launch of the partnership. Those helped include people living with a disability, mental health issue or chronic illness, the victims of domestic violence, vulnerable elderly people and low-income working families. Readings have raised over £6,000! 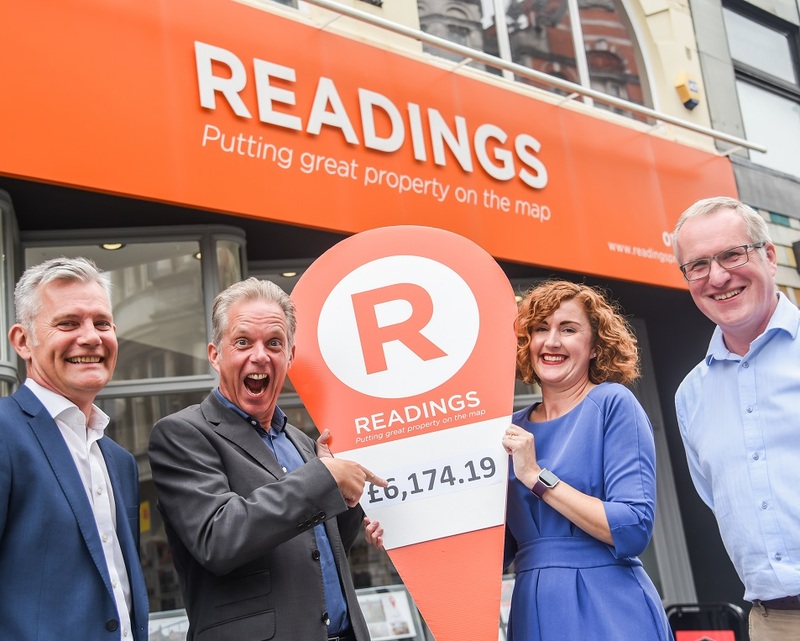 Readings – Leicester Estate Agents, Letting Agents & Chartered Surveyorsare celebrating International Day of Charity today (5th September), by pledging its ongoing support to our work, having donated over £6,000 since January 2016.Readings donates to us upon each successful property sale and also encourages clients to match this donation. It has also raised further funds via an auction, office cake sales and by supporting Wear a Funky Scarf Day each January. Due to our unique way of working Readings' amazing support has actually helped to provide over £30,000 worth of essential items to vulnerable local people so far!Thanks to all the team and to all their clients who have showed their support! Amy Wood from our Lettings team will be taking part in Charity Link’s upcoming Leicestershire 3 Peaks Challenge on 24th September, which sees over 50 challengers walking 16 miles and taking on the peaks of Old John Tower in Bradgate Park, Beacon Hill and Bardon Hill to raise funds. It’s not too late for you to register to join the team and help your local community! Will Ravenhill adds: “We look forward to strengthening our relationship and helping to raise more funds to help the local Leicester community in the future via our support of Charity Link”. For more information on the work of Charity Link, please visit www.charity-link.org.